I remember the first time I had a French Macaron. I was in New York City, and happened to be walking through the shops at The Plaza. The brightly colored cookies just called to me (and to my daughters). I fell in love instantly, as did my oldest and youngest little girls (my middle daughter has a peanut allergy so unfortunately, these little treasures are off limits to her since they are made with almond flour). The trip to Miami ended and I came home bound and determined to make these cookies. I researched a bit, and found that getting these little gems to bake up without forming small cracks across the top is quite challenging. However, while the cracks may take away from the perfect beauty of the cookie, they do not change the mouthwatering taste or consistency. So I decided I was up for the challenge. You are supposed to color the cookie to complement the filling. 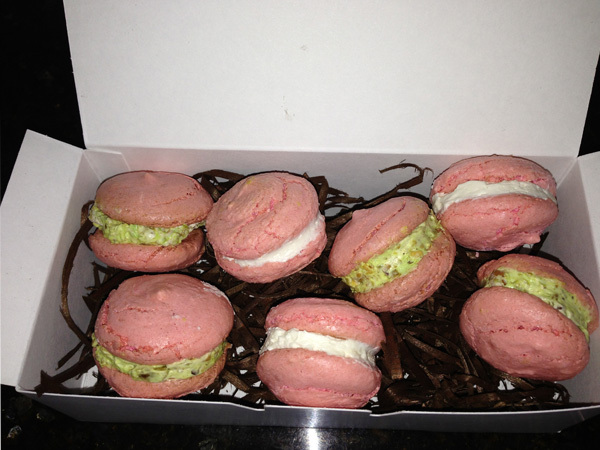 For example, a raspberry filled macaron will be colored pink; a pistachio will be colored green, etc. But, my daughter decided she wanted all the cookies to be colored pink, and her wish was my command. I filled mine with vanilla buttercream and pistachio buttercream. But no matter what you fill them with, they are delicious!!! Oh, some of mine did get small cracks across the top…who cares! They are still lovely, and they brought a huge smile to my six year olds face! That is success! PS: These are a terrific to put in Easter baskets wrapped in cello, or as an addition to your dessert table. In a medium size bowl, stir the confectionary sugar and almond flour together. In the bowl of an electric mixer fitted with a whisk attachment, whip the egg whites and salt until frothy, then add granulated sugar and whip until soft peaks form. Add the almond extract and food coloring and whip just enough to incorporate. Fold one third of the confectionary sugar/flour mixture into the egg white mixture. Once blended, fold in the remaining sugar/flour mixture. Fill a piping bag with some of the Macaron batter and pipe 1 ½ inch wide circles on to a parchment lined baking sheet. The cookies should be spaced two inches apart. If there are any peaks on the cookie, gently flatten them by pressing down with a damp finger. Tap the cookie sheet on the counter several times to release any air bubbles. Bake the cookies at 325 degrees for 15 minutes (until the macarons are crisp and easily release from the parchment paper). Once cool, turn the cookies over so that you are spreading the filling on the bottom of the cookie, (which will now become the middle) and top with a second cookie. The Elegant Occasion Note: These cookies are best stored in the refrigerator in an airtight container and eaten chilled. Another childhood favorite that my grandmother, Felicia, would bring home for us were “Half Moons”. 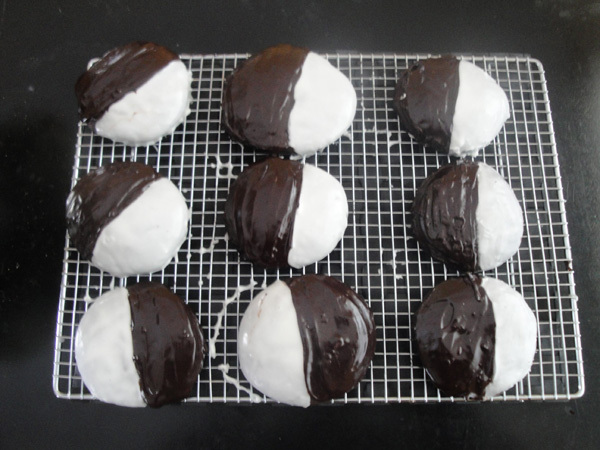 You know them as “Black & White Cookies”, but growing up in Upstate New York, they were simply called half moons. The base of the cookie (which had the consistency of being closer to a cake) was chocolate. The crumb was moist and tender. Then, the cookie was frosted in deep, dark chocolate on one side, and creamy vanilla on the other. When I moved out of state as a teenager, I yearned for those cookies. But no matter where I looked I could not find the cookie I grew up with. Oh yes, I could find a “Black and White Cookie” with a dry vanilla cookie base, but that was not what I wanted. This substitution could not come close to what I remembered as being sweet perfection. One day several years ago, my sister told me she had figured out how to make “half moons”. To say I was thrilled would be an understatement! She shared the recipe with me, and I have been making them for my kids ever since. I have tweaked the recipe slightly, to give both the cookie and the chocolate frosting a more intense flavor, and every time I make them, I am transported back to my childhood. When my youngest daughter was three, these were her favorite cookies, and I would make them at least once a week. She would say “come on Mommy, let’s share a cookie” and she would eat the vanilla frosted side and I would eat the chocolate. It was bliss! Remember, these cookies can be stored up to two days, but they won’t last that long. One batch of these is gone in just a few hours in my house…so my advice is to make extra for your Easter celebration! In the bowl of an electric mixer fitted with a paddle attachment, blend the butter and the sugar. Turn the mixer on low and alternate between adding the flour and the buttermilk, starting and ending with the flour. Add the baking soda, espresso powder and cocoa powder and mix again (don’t over mix). Using an ice cream scooper, place a scoop of batter onto the cookie sheet. Be sure to leave two inches between each cookie so they have room to spread. Place the cookies on a cooling rack and allow to cool completely before frosting. In a medium size bowl combine the dark chocolate and heavy cream. Microwave for approximately 2-3 minutes, stirring occasionally. The mixture should be smooth and silky. In a medium size bowl combine the confectionary sugar, milk and vanilla. Stir the frosting until it is a spreadable (but not too thin) consistency. If the frosting is too runny add more sugar, if it is too thick add more milk a drop at a time. Using a cake spatula spread the chocolate frosting over one half of the cookie and the vanilla over the other half. The Elegant Occasion Note: These cookies can be stored in the refrigerator (well-covered) for two days. Before serving, bring them down to room temperature. I make a variety of desserts to end the holiday meal, but no matter what else is on my dessert table, Coconut Cake is a must every year. This cake makes me think back to my maternal grandmother, Felicia, once again. When I was young she lived with us and worked in a bakery. Almost every night she would bring home wonderful desserts, and one of my favorites was a vanilla coconut cake. It had a thick layer of sweet frosting and it was piled high with coconut. As an adult I don’t have much fondness for a confectionary sugar based frosting, so I have updated my recipe for coconut cake with a light whipped cream-cream cheese frosting. When I began The Elegant Occasion and had my signature line of couture cupcakes, I turned this cake into a decadent cupcake and named it “The Kristin” after my niece/goddaughter, as it is her all-time favorite. I guess you could say that this cake (which can be made into cupcakes with no change to the recipe) has extra special meaning to me. I hope your family enjoys it as much as mine! PS: You may be wondering why this beautiful cake is pictured out in the snow. Well, if you live in the Northeast you probably understand. It has been a wild winter, but spring is in the air…I hope! Grease three 8-inch round cake pans. Cream butter and sugar together in a mixer fitted with paddle attachment. Add eggs one at a time, mixing thoroughly. In another bowl, mix together flour, baking powder, and salt. In another bowl, mix vanilla and milk. Add the flour and milk mixtures alternately to the batter beginning and ending with the flour mixture. Add in the sour cream and lemon juice and mix until incorporated. Divide batter among the three pans evenly and place in a 325 degree oven for approximately 25 minutes, or until a toothpick inserted into the center of the cakes comes out clean. Remove cakes from oven and place on a rack to cool. Place cream cheese in the bowl of an electric mixer fitted with a whisk attachment and whisk until creamy. Add confectionary sugar and mix until incorporated and smooth. Add in the heavy cream and vanilla and whisk on high speed until the mixture resembles whipped cream. Place one layer of the cake on a cake plate and spread ½ cup of the frosting over the cake. Add the second layer of cake and spread another ½ cup of the frosting over it. Add the third layer of cake and spread remaining frosting over the top and down the sides. 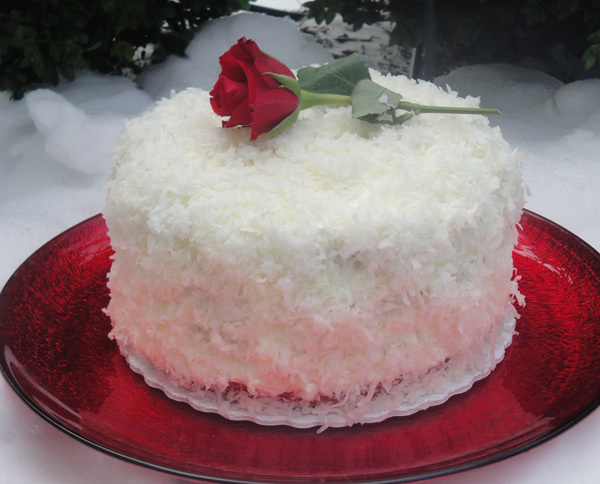 Using your hands, cover the cake (top and sides) completely with shredded coconut. Cake should be stored in refrigerator, covered with plastic wrap. Every year the star of my Easter table is the Roast Leg of Lamb. Juicy and flavorful, this dish is a family favorite (especially with my daughters). But, I recognize that some people prefer other meats to lamb, and I like to have a variety of food available to please everyone’s tastes. I usually make a very traditional baked ham, however, this year I am going to make one of my husband, Tom’s favorite dishes from his youth; a Fresh Ham (also known as the pork leg). Due to the cooking method, this roast produces a crispy skin that tastes like bacon, and is totally addicting! The fresh ham roasts slowly for about five hours in the oven, and is bathed in white wine and herbs during the cooking process. The result is a roast that is moist and flavorful and complements all the other dishes at my table (roasted potatoes with shallots, asparagus, etc). Although the picture above is of the Fresh Ham, I am giving you my Roast Leg of Lamb recipe too…It is just too good to miss out on! Score the fat about 1 ½ inches deep in a diamond pattern. Drizzle the fresh ham with the olive oil, and sprinkle on the garlic salt, thyme, rosemary, and pepper. Place the onions, celery, carrots and bay leaves in the bottom of a roasting pan, and then place the fresh ham on top of the vegetables. Roast the fresh ham at 425 degrees for 30 minutes, then reduce the temperature to 325 and roast for one more hour. When the hour is up, pour the wine and the vinegar over the meat, and roast another 3 ½ to 4 hours (or until the meat reaches an internal temperature of 185 degrees. Remove the ham to a platter and cover loosely with foil. Let the roast sit for one hour (this is very important, as the roast will continue to cook, and the juices will redistribute in the meat, which will ensure a moist roast). Remove the vegetables from the roasting pan and discard. Pour off the fat from the pan and add three cups of chicken stock. Bring this to a simmer being sure to scrape up the browned bits on the bottom of the pan. Mix two tablespoons of cornstarch and two tablespoons of heavy cream together, and pour the mixture into the sauce. Whisk vigorously until the sauce thickens. Starting at the shank end and keeping the knife at a right angle to the bone, cut the meat into slices. With a sharp knife, trim away the white skin (fell) and any excess fat covering the meat (you can have your butcher do this for you). Score small slits in the lamb with a paring knife and insert small pieces of garlic into each slit. Space the slits out making approximately 12-15 slits in total. Rub the entire leg of lamb generously with olive oil. Sprinkle the salt, pepper and fresh rosemary over the meat. Once prepared in this manner, let the meat rest for one to two hours at room temperature to absorb the flavors. Place the lamb in a 400 degree oven for 20 minutes, then turn the oven down to 325 and roast until an oven thermometer registers 125 degrees when placed in the thickest part of the meat. In total the meat will cook for approximately an hour and a half. Remove the lamb from the oven and place a piece of foil over it loosely. Let the lamb rest with the foil covering for 25 minutes. The lamb will continue to cook during that time and will achieve the perfect temperature while being pink and juicy. Transfer any pan drippings to a sauce pan and skim off the grease. With the heat on medium low, add a 1/2 cup of beef broth and a splash of red wine. Season the sauce to taste with salt and pepper and serve with the meat, along with mint jelly if you desire. A few years ago I began to experiment with a first course for my holiday dinner that embodies the brightness and freshness of spring. Thus began the birth of a new tradition for our family; Chilled Pea Soup with Mint. The color and the flavor of this soup just scream spring. And best of all, it is made twenty-four hours in advance, which is a terrific time-saver. The only preparation needed for this course on the actual holiday is chilling the soup bowls. And for new guests at my table, it always becomes a conversation starter because it is somewhat unique. My daughters love this dish, but the funniest reviews come from other children joining us for the celebration. Because the taste is so unlike what most children think of when they are forced to “eat their peas” they usually cannot decide if they like it or dislike it, so they keep eating it, until they have eaten it all! Warm the oil in a saucepan, and add green onion. Sauté the onion for five minutes until it has softened. Add the lettuce and let it wilt down for 5 minutes. Add mint, chicken broth and sugar snap peas and simmer (covered) for 30 minutes. Take the pan off the heat and let the mixture cool to room temperature. Once the soup has cooled, add in the frozen peas and cucumber. Working in batches, pour the mixture into a blender and puree. As you puree each batch, pour it into a large glass or non-reactive bowl. Add the lemon juice, salt and pepper and taste to adjust the seasoning. Cover the bowl with plastic wrap and refrigerate for 24 hours. Serve in a shallow bowl with a dollop of crème fraiche and chopped chives. For a fun passed hors d’oeuvre, pour the soup into shot glasses for a pea soup shooter.